Yes, it's a Baby-sitters Club book. 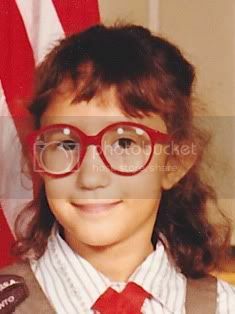 More specifically, the junior series staring Karen, the little sister of a Baby-sitters Club member. Once I started reading it, I couldn't put it down. I read all the other books in the series then moved on to the real Baby-sitters Club books. After that I was on the hunt for more series and I found Nancy Drew and the Boxcar Children. Finally I discovered of the Chronicles of Narnia (which I pronounced as "Nara" in my head for the longest time). Those books sealed the deal and made me a lifelong reader. 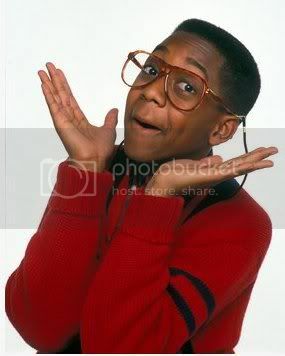 I had never seen Family Matters, but my classmates had. They convinced me to hitch up my pants and stomp around the classroom while saying "Did I do that?" over and over. Good times! So what's the lesson in all this? Don't discount the value of a light, formulaic book. It has the potential to connect with readers just as much as something outrageous or experimental. 1. 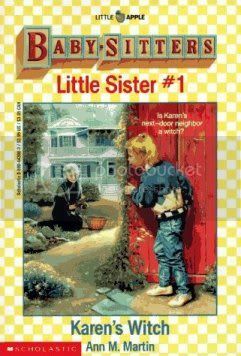 Your grandmother should get credit for buying you the first Little Sisters book. 2. Red glasses were very fashionable at the time. Talk show hostesses and your first grade teacher, Romy Roquemore, wore them. Thanks for the details, mom. It's amazing the amount of stuff I misremember from my childhood.